Diatoms are single-celled organisms that live in almost any moist environment. They are found by the millions in a cup of sea water or a puddle in your back yard. They play a critical role in the environment as oxygen producers. But they are best known for their visually stunning homes constructed of glass. I was reading about diatoms as part of my preparation for a seminar on biological diversity. One fact in particular jumped out at me: fossils of diatoms are only found from the Jurassic Period to the present day. Diatom fossils are found in just the upper-third of the fossil record. This pattern of fossils struck me as one that clearly discredits the young-earth creationists (YECs) chronology of earth history. How? 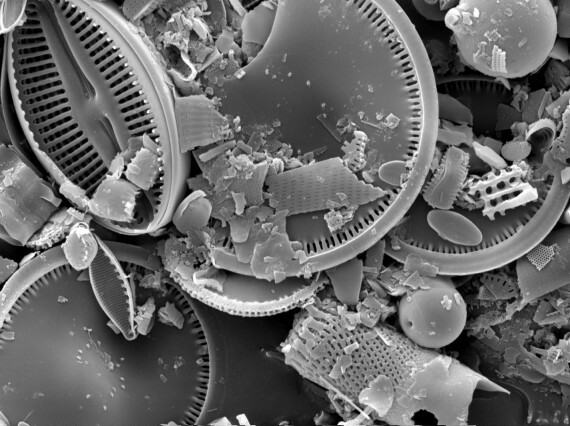 Let’s explore the world of diatoms and what they might be telling us about Earth’s history. Before I explore the connection with young-earth creationism, I noted that diatoms live in “glass houses.” Doesn’t sound safe at all, right? However, diatoms are able to synthesize glass walls, which they erect around the outside of their cell, presumably for protection in the wild world of hungry aquatic microscopic life. Despite their work to product themselves, a number of organisms have learned to enjoy eating diatoms, glass and all. Just how successful are diatoms and their glass houses? There are more species of diatoms than there are of mammals, birds, reptiles and amphibians combined: an estimated 100,000! They come in so many shapes and sizes they are like the snowflakes of the microbiological world. In addition, diatoms are photosynthetic organisms, like plants, and therefore are able to use the energy from the sun to produce chemical bond in sugar molecules. By most estimates they account for one quarter of the oxygen produced on Earth. They also account for 40 to 50% of the primary food production in the oceans. 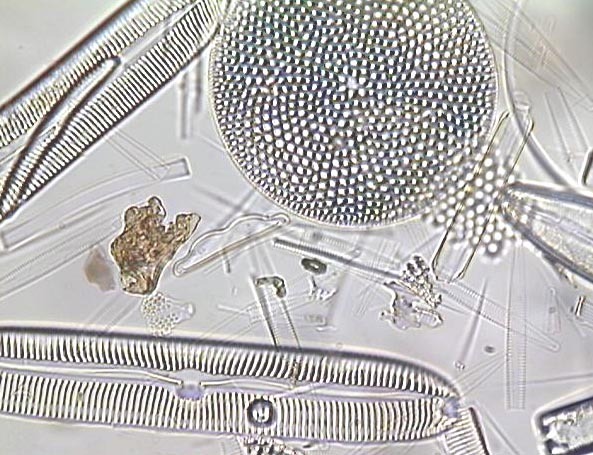 Clearly, diatoms are essential components of the Earth’s ecosystem as it functions today. As you might imagine, glass cases are readily preserved in the fossil record compared to an organisms made solely of soft parts. 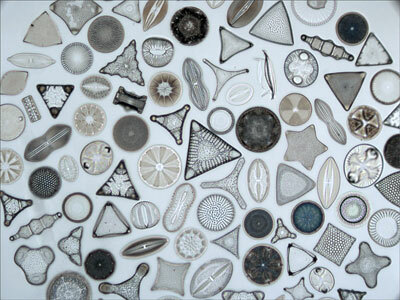 Vast quantities of glass shells of dead diatoms are found on the bottoms of the oceans and lakes of the Earth today. Deposits of diatoms, sometimes hundreds of feet thick, are found in the geological column. (1) These thick layers of nearly 100% diatoms are called diatomaceous earth, which is mined for a variety of commercial uses. We can expect that if diatoms are present in the water, one can expect that diatoms will be preserved in sediments produced under those water bodies. Scanning electron microscope image of broken bits of diatoms. Massive deposits with countless number of these glass remains are found all around the world and through the upper 1/3 of the geological column. 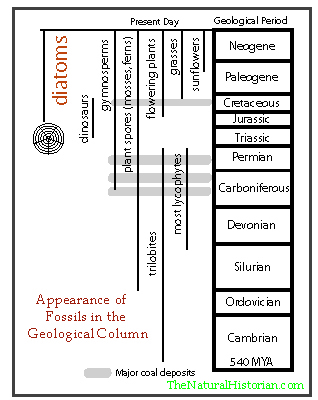 The lack of diatoms in any portion of the geological column below the Jurassic is most easily understood as evidence that glass-house diatoms did not exist prior to the Jurassic age. (2) Non-glass producing species probably lived in the Triassic but their soft bodies, not surprisingly, were not preserved. Yet as soon as a species of diatom obtained the ability to produce a glass exterior wall, those walls would have been readily preserved in the fossil record. The glass-producing novelty was apparently a huge success and soon new diatom species filled the oceans and fresh water systems. While dinosaurs were unable to maintain their dominant status over the land the diatoms not only outlived the dinosaurs but have become one of the most common organisms on Earth. Prior to the Jurassic, there were hundreds of thousands of species of single-celled organisms that produced other types of external cells walls. For example, the coccoliths produce a calcium carbonate shell, which are well-preserved in the fossil record. These still exist today. So we know that glass-walled organisms could have been preserved during this time had they existed. However, we have no evidence that they did exist at this time. Since diatoms today are so abundant, and since they are such an important member of the food chain, the lack of diatoms in the past allows us to infer that other organisms must have once played a much more dominant role in the food chain. In fact, there was a much greater abundance of other organisms such as foraminiferans and coccoliths and others. Several species of diatoms viewed under a light microscope. It is the glass housing that forms the shapes that you see here. Diatoms are another embarrassment for young earth creationists (YECs). Rarely will you hear them mention the fossil record of diatoms. YECs explain the geological column as the product of massive world-wide hydraulic sorting and/or ecosystem sorting. The latter hypothesis proposes that the global flood first covered deep-ocean environments, then covered shallow seas, and finally the lowland tropics. All the while, large animals were running away from the global flood to higher ground, only to be swallowed up later. While this scenario is fanciful and unsupported by experimental or simulation data, it has a certain appeal to the evangelical audience that simply wants to know what happened to the dinosaurs. But ask serious questions about other organisms, especially small organisms, and the flood-geology hypothesis is confronted with grave inconsistencies. For example, what about the diatoms? What would the flood-geology hypothesis predict about the distribution of diatoms in the fossil record? The obvious prediction would be that if diatoms have existed since the creation week, then they should have been widespread prior to Noah’s flood. At the onset of Noah’s flood, when much of the sediment of the earth was dissolved in water, diatom shells and living diatoms should have become mixed up with the water and sediment column. When sediments were deposited, diatoms would have found themselves randomly distributed throughout the geological column. The problem is, there is no a priori reason to expect that diatoms should have sorted out into just the upper layers of the geological record, which is what we see today. In addition, there is no explanation, that I know of, to explain the lack of diatoms in the early rock record within a flood-geology model. In a flood geology sorting model diatoms might be expected to exhibit at least local sorting into sizes and shapes but even this minor amount of sorting is not observed in the fossil record. The YEC flood geology hypothesis utterly fails to explain the observed distribution of diatom fossils. The 180-million-year date is correct, but DeYoung doesn’t point out the significance of their appearance so late in the fossil record. He attributes the origins of diatoms to the creation week, thus placing them as part of Earth’s biota from the very beginning. The article is about the intricate designs and uses of the glass houses of diatoms. He attributes their designs to an immediate vs providential creation. He is claiming that God created diatoms as glass-house makers from the beginning. Therefore in the creation model diatoms should be ubiquitous in the fossil record. Diatoms should be found in the oldest rocks attributed to natural processed after creation. This would include the Precambrian through the present. The lack of diatoms in more than 50% of the geological column directly contradicts the flood geology model. This observation remains unaddressed by young-earth creationists. Sometimes the biggest problems come in the tiniest packages. (1) The very existence of thick layers of diatoms in the fossil record can’t be explained by flood geology. Scientists have studied the time it takes for diatoms to sink in a body of water and they have observed rates of accumulation of diatoms at the bottom of lakes and oceans. At best the rates of accumulation are only a few centimeters per 1000 years. To have meters of diatoms deposited to the exclusion of other sources of sediments would require a constant environment for tens of thousands of years and yet the YEC must believe that these thick layers of diatoms were deposited during a chaotic global event over a period of a few days, weeks or at most months. (2) There is one report of diatom fossils from the upper Jurassic period but that report is debated so it is not clear that diatoms with glass walls were present before the Cretaceous Period which is near the end of the dinosaurs. I should also point that the silica of the glass walls will recrystallize under high pressure so many diatoms from deep in the fossil could have been destroyed. However, this would not explain the complete absence of any diatoms. There are many fossils of single celled and soft-bodied organisms preserved in very old rocks which should also contain diatoms had they existed at the time and yet they do not. Am I remembering right that in contrast to diatoms, forams are throughout the geologic column? Yeah, they go all the way back to the Cambrian though apparently didn’t really take off until much later. I may have to have a short follow-up post on them. They do form a nice contrast with diatoms. Interesting stuff. Presumably all silicaceous diatoms form a clade. The molecular record is consistent with such a late origin; see http://www.sciencedirect.com/science/article/pii/S1055790396900883 Was the invention of the glasshouse a one-off event, or had it happened repeatedly but failed because of competition for available marine silica? Will we ever know? Paul, I believe they do form a single clade but that doens’t assure that the use of silica was discovered only one. There could have been non-silica using members of the clade for long period of time in which silica-use was discovered twice or more. Since some plant lineages have also learned to produce glass structures the biosynthetic pathways we know it is possible for them to evolve independently. 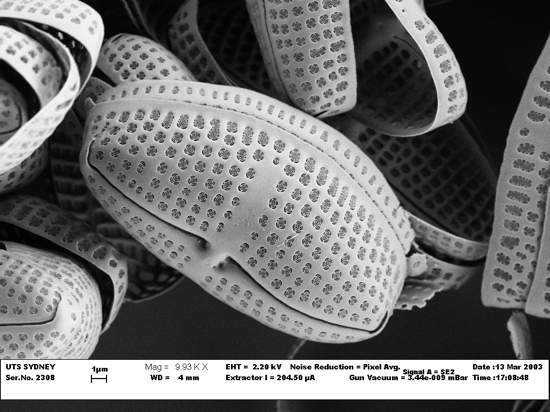 I think it is likely in diatoms there is a single origin but we can’t know for sure. Thanks for this post! I quite enjoyed it, as usual. I think these kind of organisms are particularly problematic for Flood Geology because there is no real reason, as you noted, as to why they wouldn’t be found all over the place. Similarly with flowering plant pollen and the like. It just “happens” that these just got neatly sorted into time periods? Do you not think that the later follows from the former? Ah, yes, they are not likely to point out the problems with their own hypotheses. Will a YEC be along shortly to inform you that saying the diatoms were not around until the Jurassic period clearly contradicts what the book of Genesis reveals to us in chapter 1 about the creation of plants that live underwater during the first week of life on Earth? Possibly not. “… they have not improved over time”. I see the YECs in DeYoung have (unintentionally?) ruled out the future possibility of their ‘flood geology’ postulating that diatoms only developed glass walls as part of ‘adaptation within kinds’ after the fall but only about say one year before the flood happened. meh they will just claim adaptation. Great post! In addition to their distribution as a whole, aren’t species of diatoms preserved in a predictable sequence, like other organisms, as new species evolved? That would add another layer of difficulty, explaining why certain species of diatoms are only found within certain layers. From what I’ve read forams and diatoms make good index fossils for that reason. Absolutely. Funny, I just looked at your comment minutes after posting my follow up article which was on forams. I was going to include the index fossil information for just the reason you suggest but it took more text that I wanted to use. I am attempting to keep my posts shorter with fewer points. I may follow up with yet another post on index fossils. BTW, the bottom graphic on my new post does show the changes over time I just didn’t emphasize them. Hi. Thanks for the feedback. I am well aware that this is what Snelling says. He asserts this without any evidence that is different that him showing that this is what happened. Anyone can say, diatoms did this or that but that doesn’t make there statement truthful. Snelling does provide a reasonable mechanism nor any mechanism for sorting diatoms into only the very top layers of flood deposits. The whale example has a lot of problems and Snelling does not report the all of the hypotheses of the original authors. Locally diatoms can be deposited as very high rates and diatom sludge can be moved around by currents. yes a global flood has currents but the diatom deposits are not consistent with this being the primary deposition mechanism but only a localized (not global) phenomena. Why drag in YEC silliness at all? It’s not worth the bother, imo. You will never convince them no matter how high the pile of reliable contradictory evidence, no matter how unassailable your logic. They do not wish to be convinced and they don’t care a whit about scientifically demonstrable truth. They only wish to preserve their belief system. Theirs is a different world and they are happy there. would you mind explaining how a whale skeleton was found whithin diotom earth if it gets deposited over billions of years? did it fall on top and get fossilised before it got covered? Hi, I’d have to have an idea of which whale fossils you are talking about becuase there are several possible mechanisms. Certainly “billions of years” is a reach in any case since even several meters of diatomaceous deposits took no more than a million years and probably only 10s of thousands of years to be deposited in many locations. There are whales bones today that are buried in many centimeters of diatoms that have been found showing that the process occurs today. Most whale bones that find themselves at the bottom of the ocean will be decayed before they are covered but not all, the fossils record in many cases records for us the exceptions not the rules but again, I am not sure which fossil you are referring to specifically so I can’t be very specific in my response.